Morgana Diagonal Ribbed Cowl is a trendy, easy-to-make cowl using Captain (a soft, wool/acrylic blend) and Cotton Spa (a soft cotton bamboo yarn with a subtle sheen). 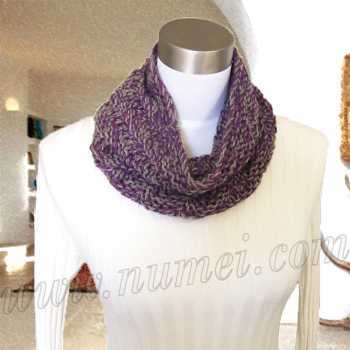 The combination of the two yarns make for a nice material and a cowl that is comfortable to wear. Mix and match colors of Captain wool/acrylic yarn and Cotton Spa cotton bamboo yarn to obtain a multitude of color combinations. Circumference 20" x Height 8.5"
Holding both yarns together, cast on 57 stitches loosely. Join to form a circle, making sure not to twist sts. Place marker to mark beginning of round. Repeat Rd 1 and 2 once more. Work Pattern Stitch till piece measures 8" from beginning. Work Rd 1 & 2 twice.